County School Supt., T. S. Thompson, announced that Friday, October 4th will be set aside as “Play Day”. In addition to the students, all residents young and old were invited to participate in the activities. The local board of education announced that the Oregon schools plus eight surrounding rural schools will observe the day. The first assembly will be held on the school grounds at 10:00 a.m. The participants will be divided up by age and games will played until noon. The second assembly in the afternoon takes place in the high school. During the first period there will be singing, recitations, and drills, etc. Then at 2:00 p.m. a patriotic address will be given by Mr. Frank Hall of Madison. The Library Board met for its annual election of officers. Those elected were Dr. W. H. Dreher, president; U. T. Cady, vice-president; Donald McGill, secretary; and Mrs. John Gilbert, treasurer. The famous war photos based on the book “Over the Top”, featuring the author of the book, Sgt. Arthur Guy Empey, was being shown at Olson’s Opera House. The area presentation, supported by James and Lois Morrison, was described as “a stupendous photoplay of the most sensational soldier’s story ever written’. The U. S. Postmaster General announced that there would be an examination for the position of postmaster of the Oregon Office. Applicants were to be a U.S. citizen, least 21 years old, but not older than 65 and must reside in the delivery area of the office now and prior to the position being posted. The annual compensation is $l,400. Mr. and Mrs. Peter Rasmussen observed their sixtieth wedding anniversary; a rare event in 1918. 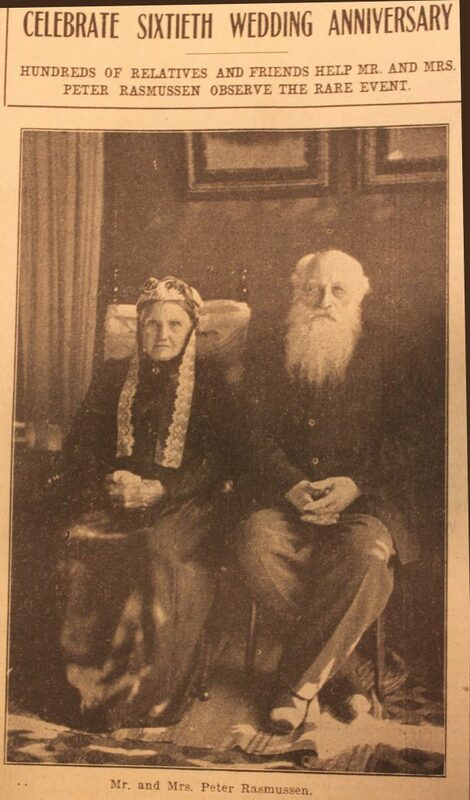 They were married in Denmark in 1858. Over 300 attended the anniversary celebration held at the Lutheran Church and later at their home. At present the elderly couple made their home with their daughter, C. T. Johnson. They had six grandchildren serving in the U. S. Armed Forces. Five of the six were fighting in France, i.e., Axel, George, Charles, William Johnson, and Elmer Peterson. The sixth grandson, Leo Johnson, was training in Minnesota. William Hayes is having the building he recently purchased from the Hausman Brewing Co. remodeled and repainted. He plans to use the building for his harness shop. It was noted that Stephen Hook who had made his home at the Fess Hotel in Madison during the recent past has returned to Oregon and now resides at the Portland Hotel. 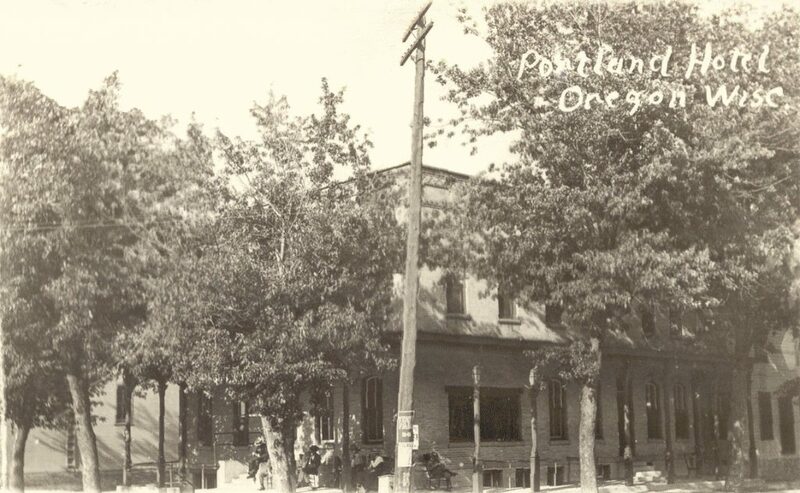 A third Hotel in Oregon was the GRAND CENTRAL/PORTLAND HOTEL. This is the present site of Madsen Park. Originally on this site was a home owned by John D. Tipple and later owned by J.P. Main. The house burned in 1873. The Grand Central Hotel was built between 1880-1883. About 125 residents of Hillcrest Drive, Gail Court, and Orchard Drive held a neighborhood picnic. Activities included football, kitten ball, badminton, tug-of-war relay races and a pot luck meal. Room mothers for grades kindergarten through sixth grade were selected. These volunteer room mothers will assist the teachers on special party days and class trips. Paul Kohlman and Robert Tarkenton along with other area hunters, returned from a 11 day Canadian moose hunting trip in northern Saskatchewan. Paul bagged a huge moose having a 48-inch rack of antlers and weighing between 1400 to 1500 pounds. Urban Johnson, Dane County District Manger for Wisconsin Power and Light, welcomed John Wendt to the community. John took over as Chief Clerk for the district. Dr. Robert M. Morris spoke at the Woman’s Club Guest Night. Topic of his address was “Our Doped-Up Society”. He covered the basic areas of drugs and dope that people of society use incorrectly, creating problems for themselves and others. Also at the meeting, Observer publisher, Butler Delany and his wife. Violet, were given special recognition for their support of community activities. The newly organized Oregon/Brooklyn Jaycettes elected their officers. Carol Martinson, president; Jan Cole, vice-president; Louise Rhead, secretary; Kathleen Callaway, treasurer; Mary Jo Lease, state director; Barbara Fritz, projects chairperson; Nancy Dorman, program chairperson; and Sally Mueller, publicity chairperson. The Oregon Fire Dept., assisted by Brooklyn firefighters, fought a barn fire on the Glen Bethel property at 222 Jefferson St. The barn and its contents were completely destroyed. The School Board studies problems of rapid enrollment increase. The school system has been picking up about 100 new students each year. Reigning over the 1968 Homecoming activities were Nick Brashi (King) and Janet Trosper, (Queen). At the pep rally, following the announcing of the royalty, Chamber of Commerce President, Dr. J. W. Plummer, presented the Queen with a dozen red roses and a charm bracelet. In other activities the Sophomore Class won first place for their skit, “Oregon, Dating Capital of the World” and the FHA won first place for their parade float “Panda”. The Annual Collection for UNICEF was collected in the area on October 30th and 31st. President Johnson had named October 31st as National UNICEF Day. Nancy McGill worked as the director of the door to door freewill offering in the Oregon Area. Jo-Dot Ceramics (Joe and Dorothy Tauchen, props.) held a Grand Opening at their new location at the intersection of highways 14 ( now Cty. MM) and Hwy. B. The building was built by Wick Building Systems of Mazomanie. Around 700 people attended the event. In addition to their one full time employee, Mrs. Ruth Smith, their 18 year old daughter, Mary, is also helping with the business. They have classes for 60 to 100 students. Dorothy also instructs a workshop for 30 teachers. Oregon Heating & Air Conditioning is in the process of building a new facility at the Netherwood and Market Street intersection. Recently retired, Oregon school superintendent, E. A. Kozlovsky, dies unexpectedly after having served the Oregon School System for the past 41 years. The Choral Boosters, with the support from Hardees, plan for a New York tour in March of next year. The New York tour will include a performance in Carnegie Hall along with other distinguished choirs from Wisconsin. The School District Administrative Offices moved to the remodeled upper floor of the Netherwood Knoll Elementary School (formerly Oregon Junior High School). Improvements were made to Bethel Park with the help of many volunteers and the support of local businesses. Playground equipment was installed and a basketball court made. Much of the incentive for the improvements were organized by the Hickory Estate Neighborhood Association. The Three Gaits Therapeutic Riding Program celebrates its 10th Anniversary. Seventeen Oregon students participated as members of the Wisconsin Youth Symphony Orchestras 1993-94 season. The participates were Matt Pickett, David Skogen, Julie Wood, Dawn Texel, Connie O’Brien, Sarah Halverson, Ian Honeyman, Allison Gipp, Aaron Gooze, Annelisa Guries, Nate Kuehl, Geri Nolden, Erin Vanderpan, Joseph Okada, Catie Honeyman, Anne Bukowski, and John Olstad. Four OHS musicians participated as members of the Wisconsin Honors Music Project in concerts at the Wisconsin Music Education Convention. Those participating were Sarah Halverson (violin) and Julia Wood (viola); who played in the Wisconsin Honors Orchestra; Jim Uphoff, who sang in the Wisconsin Honors Vocal Jazz Ensemble; and Chad Grote, who sang in the Wisconsin Honors Choir. Showcase Camps and Productions asked five Oregon students to appear in their 1994 Citrus Bowl half time drill team. 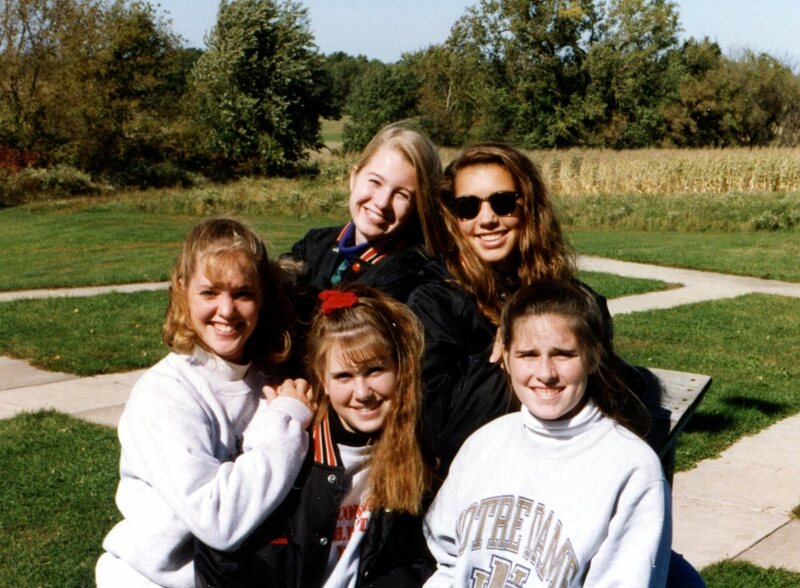 Selected were Dana Schneeberger, Dawn Zuehlke, Kristin Woodworth, Jessica Wilkening, and Jenni Gefke. The Optimist Club elected new officers. Those elected were Dan Floeter, president; Dan Behrend, 1st vice-president; Russell Bavery, 2nd vice-president; and Cliff Lawson, secretary/treasurer. Elected for the board of directors were Rodney Potter and Maynard Stoehr. The OHS Concert Choir was selected to preform at the 1993 Wisconsin State Music Conference. The choir had the distinction being only one of four choirs in the state to have received this honor. Tom Mielke was the choir’s director. Three runners of the Oregon Cross Country Team, Mike Eiscle, Angela McAllister, and Meghan Werth, were honored with All-Badger Conference titles. The Rev. Mary Council-Austin, pastor at the Brooklyn Methodist Church 1984-1986, returned for a visit during the church’s 1st Annual Friends Day. The Village Board purchased the Stack property on Florida Avenue that had been flooded in August of 2007 and awarded a contract to Nelson Excavating LLC for its demolition. Matthew Klutzke is appointed the new director of the Oregon Youth Center, replacing Shane Gahagan. The reconstruction of downtown Oregon progresses on schedule, including the Jefferson St. railroad viaduct. The Oregon Public Library announced Sunday hours. Starting in October the library will be open 1-5 p.m. on Sundays though the last Sunday in April. Two OHS girl golfers, Mckenzie Parks and Abby Busler were named to the Badger South All-Conference Team. The United Brethren Church in the Town of Rutland (south of Oregon on US Hwy. 14) is being restored. The original structure was build in 1852-53. A group of concerned citizens have raised $50,000 to continue with its restoration and to submit a request to have it listed on the National Register of Historic Sites. The Lemery House (159 South Main St.) joins with the Chamber of Commerce in planning a 1st Annual Village-wide Arts Festival. Some of the local artists displaying their work included Ann Kleckner, Terrry Kisling, Laura Wilder and Mary Schnelle as well as many others. As part of tne festivities guitarist/singer Eric Schoff, a teacher at the Academy of Sound, performed in the Triangle Park. The Grand Opening was held for the new sports arena with its indoor skating facility. Participants at the Grand Opening included Tony Renlund, OHS hockey coach; Jeff Groenier, OCSA board president; and Casey FitzRandolph, 2002 Salt Lake City Gold Medal Winner. The parents of Angela Drake, Tim and Anne Olson, were also there for the presentation of a plaque dedicating The Angela Drake Community Room. OHS cross country athletes that earned Badger South All-Conference Honors were Matt Bakken, Morgan Engelhart, Annie Heifner, Kall Jahn, Allie Heifer and Max Mixdorf.